Leesburg, Virginia, October 2018 …The National Conference Center, the largest conference center on the East Coast, has partnered with the wickedly fun and haunted, Shocktober, featuring an authentic 19th Century Victorian Gothic Mansion, to create a Halls of Horror Screambuilding meeting package this October. The National enhances the learning experience by offering value-add amenities, creative teambuilding and a hyper-local culinary program to meetings. Shocktober’s Haunted Mansion benefits the nonprofit, The Arc of Loudoun, an organization dedicated to serving children with disabilities and their families. Shocktober’s Haunted Mansion is just 15 minutes from The National. During October’s Hall of Horror event, the Black Olive Bar & Grill has been transformed into a Haunted pop-up bar with themed cocktails such as the Vampire’s Kiss Martini and the Zombie as well as Witches Brews from local Solace Brewing Company. Proceeds from the Halls of Horror Package as well as 10% of the spirits sales from the Black Olive will be donated to The Arc of Loudoun. In addition to the Halls of Horror package, The National’s expert conference planning staff can integrate a variety of creative teambuilding experiences to a meeting program. 1. Hallways, Tunnels and Spooky Hiding Places. Depending on the size of a meeting, The National’s unique, individualized meeting space offers conference rooms, outdoor space and teambuilding on the Challenge Course. With 265,000 sq. ft. of meeting and event space, offering 250 purpose-built conference rooms, breakout rooms and general session rooms, The National connects this space through miles of maze-like hallways and underground tunnels that provide unsurpassed spookiness. The National’s conference planning team can create scavenger hunts, wayfinding games and nighttime creepy, crawly adventures throughout a meeting, allowing for creative teambuilding and screambuilding. 2. Create a Hyper-Local Haunted Food Experience. October is not only the month of spookiness and haunted houses, but it’s Virginia Wine Month. Virginia, ranked fifth in the country, has over 400 wineries. The National focuses on hyper-local farm-to-table cuisine incorporating over 60 local products, including wines from Loudoun County, Virginia. The National is the only conference center with a Chief Wine Officer on staff – Mary Watson-DeLauder. The conference planning staff can arrange dinner, snacks and/or drinks in the Black Olive Bar & Grill, which has been decorated for spookiness. Mary’s unique wine tastings and seminars, like her Herb & Wine tasting, make for a great and flavorful teambuilding event and The National Secret is the perfect venue. 3. Develop a Memorable Screambuilding Experience. Screambuilding is the new teambuilding here at The National. Once attendees visit Shocktober’s authentic Haunted House, they will bond…they will scream together, hold hands, support one another…and them join in the fun at The Black Olive Bar & Grill. The next day they can continue their experiential learning on The Challenge Course, an action-based learning experience with a high ropes course and other elements strategically placed within the 65-acre campus of The National. In addition to the Challenge Course, The National has created eight Creative Meeting Room Concepts, each with an individual theme, to be used for teambuilding, communication exercises or facilitated workshops. Each is designed and outfitted with décor, lighting and music, along with food and beverage breaks that complement the themes. Planners can book these rooms for half day, full day or even just for a few hours. Additional cost based on meeting programming and facilitators. 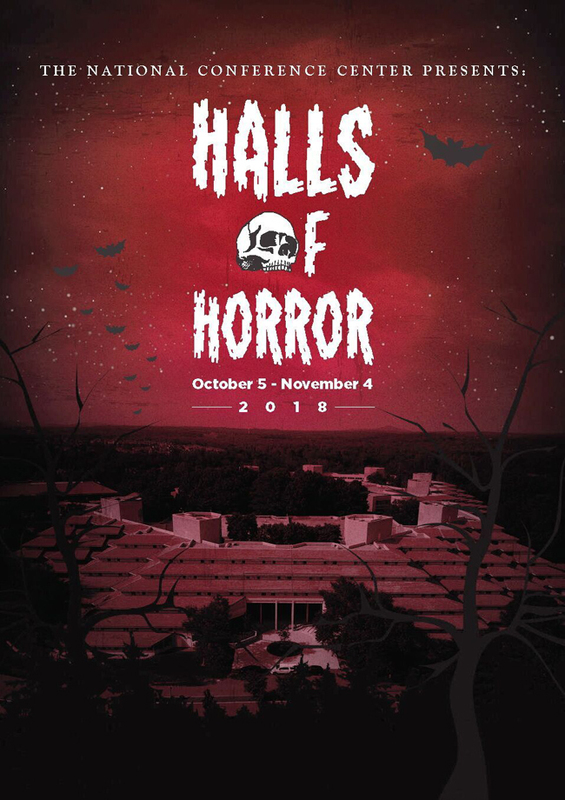 For more information and to book The National’s Halls of Horror Meeting Package, call 703-724-5111 or email sales@conferencecenter.com for more details. Every fall, Paxton Manor in Leesburg, VA transforms into a 4-story, terrifying, award-winning haunted house, giving thousands of patrons the scare of a lifetime. Built in the late 1800s, Paxton Manor has become the topic of many urban legends and a must-see attraction for thrillseekers across the country. The real reason for Shocktober? It’s the largest fundraising event for The Arc of Loudoun, a local nonprofit creating a lifetime of opportunities for children with special needs and their families. Shocktober 2018 is open every Friday, Saturday, and Sunday from October 5-November 4. Tickets are on sale at shocktober.org. The National Conference Center is owned by NCC PS Enterprises LLC, a venture between PCCP LLC and Stoneleigh Capital LLC, which retained LaKota Hotels & Resorts to oversee all aspects of the day-to-day operations. For information call 800-640-2684 or visit www.conferencecenter.com and www.westbelmontplace.com.